Authors: Przemek Mróz, Y.-H. Ryu, J. Skowron, et al. 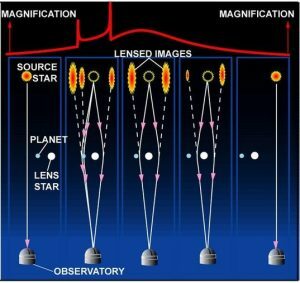 In today’s paper, the authors present microlensing event OGLE-2016-BLG-1540, which they attribute to the detection of a rogue planet candidate. In addition to detection, today’s paper presents the first measurement of the Einstein ring for this planet. The Einstein ring refers to a ring of light around the lensed object when it is directly behind the lens when seen from Earth; this way, light rays pass evenly on all sides of the lens, which causes a sudden dramatic increase in the brightness of the lens, sometimes by as much as 1,000 times. In the case of a star lens, the brightness would subside over the course of several days, but because the lens in this case is a planet and not a star, this event took much less time to subside. Therefore, it is difficult to measure the Einstein radius for small objects like planets, but these authors were able to do so; this Saturn-sized rogue planet has an Einstein radius of about 9.2±0.5 uas. This ring size is a function of the planet’s mass and radius, so the authors were able to use their measurement to extract this information about the star. 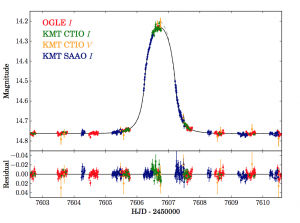 The authors used OGLE observations and also used data from the KMTNet survey, which is a network of spatially separated telescopes, to give them continuous coverage of short timescale microlensing events. Below in Figure 2 is the observed light curve from the microlensing event in multiple filters. From this data, the authors created a model to uncover more details about the system. Figure 2: The light curve data and modeling of microlensing event OGLE-2016-BLG-1540 are shown above in both I (solid black) and V (dashed gray) bands. The ring measurement was made using on the I- band data, since the authors were able to take those observations more easily. This microlensing event occurred in the span of 0.320±0.003 days. Up until thus point, all reported free-floating planet candidates lacked direct measurements of the angular Einstein ring size. OGLE-2016-BLG-1540 is the first case for which the authors procured an Einstein ring measurement, owing to the authors’ perfect timing. Additionally, since this source is a giant planet, it is easier to detect, which the authors note in their discussion. The authors note that a larger sample is needed to fully understand the origin of rogue planets. Luckily, more measurements like these will be possible in the near future with WFIRST. This mission will monitor 200 million Galactic bulge stars once every 15 fifteen minutes with high precision photometry, which will increase the number of observed microlensing events and rogue planet detections.